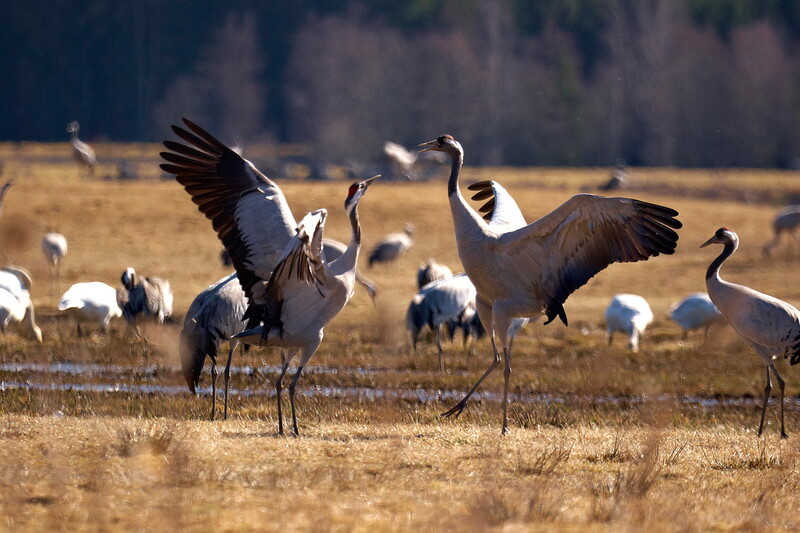 One of the surest signs of spring in Sweden is the arrival of tens of thousands of Eurasian cranes at Lake Hornborga (Hornborgasjön) in Västergötland, the most important stopover on their annual migration from Spain to their breeding grounds in the far north. The cranes typically begin to arrive around the second week of March, with numbers peaking around the end of the month and first week of April. 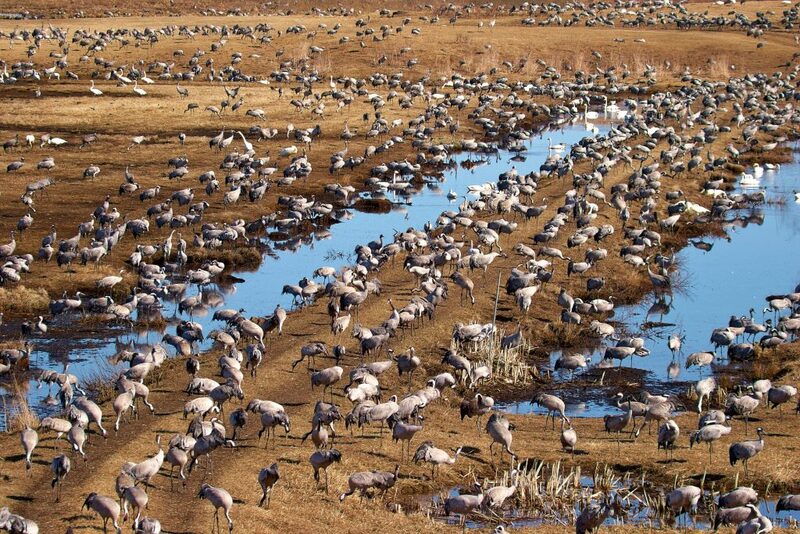 The cranes usually stay in the area for a couple of weeks, feeding on grain and engaging in courtship rituals that include raucous calls and a lively mating dance. They spend the night standing in the water for security from predators, flying off at dawn to their feeding grounds in nearby fields and returning to the lake in the evening. On any given day between mid-March and mid-April, there may be at least 10,000 cranes around the lake. On April 3, 2019, a new single-day record was set, with 27,300 cranes landing at Lake Hornborga — 800 more than the previous record set on the same date in 2012! By late April the birds have moved on, and the spectacle is over until the next year. Lake Hornborga is located northwest of Gothenburg, in the triangle formed by the small cities of Skara, Falköping, and Skövde. 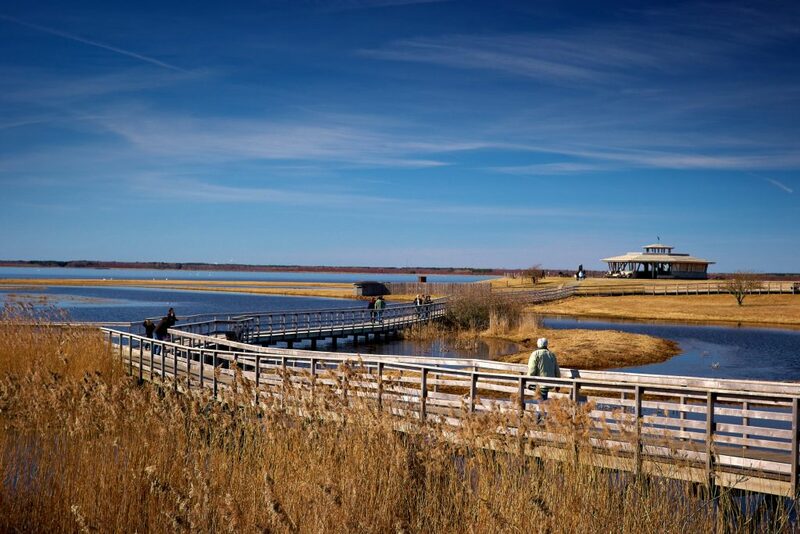 The Trandansen (Crane Dance) visitor center at the southwestern corner of the lake has exhibits about the cranes and other facilities for visitors; guided crane-viewing tours depart from here several times a week in April. There’s another visitor center, called Naturrum Hornborgasjön, on the eastern side of the lake, with access to walking trails. Even when the cranes are not present, Lake Hornborga is an excellent place to see a wide variety of other bird species.